“I just wanted to let you know that Stock Market Challenge was by far our most popular masterclass in 2018, with a lot of positive feedback coming through from both staff and students! So, firstly, a huge ‘thank you’ from us, and congratulations! Your SoapScience workshop was also a Session highlight, at the same level as some of our social program activities (including a trip to London) in terms of popularity! On 12th November we delivered the keynote speech at the Walkden High School Year 11 GCSE Awards Evening. We delivered part of the LAUNCH talk about focussing on your future, being resilient and not giving up…especially when you’re not finding things easy! “I’ve been meaning to tell you that your LAUNCH session on inspiration and motivation achieved the highest positive evaluation of any of our student CPD sessions – with 90% students rating it as good, very good or excellent”. Keeping 180 students engaged after school on a Friday is no mean feat. You did a great job of it Bernie. Thank you for the inspiring words and laughs. Thank you very much for running and contributing to such a successful and effective event. I really enjoyed it! The day went really well and all the feedback has been very positive. Both events attracted outstanding feedback from students, teachers and clients. Our senior leadership team, who were co-incidentally in Jersey and joined us throughout the day, have been extremely complimentary about the event and have even enquired about rolling the concept our to our wider business. Reed’s School, Surrey. Life By The Balls (testicular cancer workshop). You delivered a serious topic in a very accessible and thought-provoking way, delivering some important messages that I am sure will stay with them. (450 Sixth Formers – co-educational). Thank you very much – Mrs M. Francis, Head of PSHE. Our Lady & St Chad’s Catholic College, Wolverhampton. Achievement Coordinator, Becky Gingell said “the staff told me the students were really respectful and did really well presenting. Thanks to you and Joe for the excellent delivery as usual, the day flew by and the pupils loved it. All have given some great feedback. Thank you”. Here is the page with a full Case Study on the session. Head of Marketing, Ashburton Investments – School and Corporate Event Nov ’17. As you are all aware, we held our second Ashburton Stock Market Challenge and inaugural academic edition. The marketing team are most importantly, delighted by how everything turned out. Student, Aylesbury Grammar School, Life By The Balls, Sixth Form May ’17. Thank you for delivering a fantastic talk today, it was the perfect tone and your message has clearly been delivered! Genuinely was the best talk we’ve had from an ex-AGS student and I’m 100% sure my colleagues will agree!! Michael, Student, Aylesbury Grammar School, Life By The Balls, Sixth Form May ’17. Kind regards, Michael. [e-mail to head of Sixth Form]. Lena Khudeza, Woodbridge High School. #LAUNCH exam motivation session, March ’17. Bernie, a huge thank you for coming in to speak to our students! Al Wilson, Centre for Leadership Performance, Cumbria. In our team meeting yesterday we had a quick review of last Friday’s Dream Placement Celebration Event and decided it was brilliant – great audience, great venue, great structure and discussion and a great atmosphere. We really appreciate the job you did [as panel host] and the slick, professional, flexible, informed and humorous way you handled the dialogue and debate. Thank you. Becky McGowan – Brownhills School, Walsall. It was my pleasure! The Rock Club maths / enterprise session was a great experience for both staff and students. I have had a number of year 8’s ask if the next focus day will be similar as they enjoyed it so much. I have been meaning to thank you and Rad for travelling so far to make yesterday a reality, also it was so very kind to bring along prizes and extra resources that I know the students put to good use in their displays. Thank you to you and Millie for all you did last week with our S2 classes. We’ve had lots of great feedback and the photos show what a positive event it was for the pupils. For us, it really builds on the enterprise work done in June and sets us up well for the design challenge in November so we know it is a winning formula. Really appreciate all you do to make it so successful. Here’s a link to the School’s review of the 2 days. Fran Edwards, Alperton School, Wembley. Dear Patrick Grace and Gema, Thank you for today. The staff cannot speak highly enough of the Stock Market challenge day. The feedback at lunch was great from students! Bernie, you have definitely convinced me that anything your company delivers is of the highest quality. Please send me over the brochure again. Best regards I will be in touch. Fran. Yvonne Lang, Ermysted’s Grammar, Skipton. Please pass on my thanks to both Millie and Rad – they were my first event of a very tiring week and it went brilliantly. They were so good with the boys and we got some impressive soaps out of it as well as all the useful educational outcomes! I’m glad Ermysted’s made a good impression on them, hopefully we will have the chance to work together again in the future. Matt Burnage, Oxford Royale Academy Summer Schools. Thanks for your hard work over the course of the summer – I’ve heard nothing but glowing praise for your workshops, from staff and students alike! I’ll be putting in an appropriately good word for you to my successor, and I have no doubt that ORA will be welcoming you again in 2017. Eddie Owusu, King’s Winchester. Stock Market Challenge. Thanks once again for the great job you’ve done over the last three mornings. As I said the positive feedback has been overwhelming, from teachers and pupils alike. Especially teachers who enjoyed the upbeat nature of the task. Many have already asked to join in next time. I also think it has inspired/encouraged teaching staff to: think about other ways to engage the youngsters, think about how departments can link together and there’s even been an idea to run SMC as a staff/community social. So well done, it’s been well worth it. Kelly MacAnally, Litherland High School. You were brilliant. Both staff and students had a wonderful and memorable afternoon. There was such a buzz. Thank you for your time and hard work!! Gemma Hay, George Heriot’s School, Edinburgh. We’ve worked with Innovative Enterprise for over 6 years. The input they provide into our Enterprise curriculum is brilliant – the days are tailored to the needs of our pupils and the team deliver a high impact, memorable event with lots of very practical learning for pupils. Bernie and his team are hugely personable, well organised and they really understand how a school works – their sessions run to time and only require space and some tables: everything else is provided by them. We’ve looked at other enterprise education providers but feel that IE continue to provide the best learning experience for our pupils and enables us to use the experiences from the workshops to develop enterprising skills through the curriculum. Pupils still talk about the IE Soapbox day years later! I’m very happy to recommend them to others. “Your session – to launch Global Entrepreneurship Week (GEW2015) at Blackburn College – was brilliant and everyone enjoyed it. The employers were impressed by the students’ presentations which is important in terms of the external PR you gave our Enterprise Week. Thanks for your help and we will certainly be looking for you to run other sessions”. Firstly, may I thank you for visiting St Edmund Arrowsmith Catholic High School this morning and delivering your workshop so brilliantly to our 240 year 11 pupils. It is always a pleasure to invite you to our school, because we always know that you will really bring out the best in our pupils. As we briefly discussed, we are always very interested in any other workshops that you deliver and/or would like to trial with our pupils. Please do not hesitate to contact me regarding the ideas you mentioned, we would be more than happy to consider how this could fit into our curriculum. Dear Bernie. Life By The Balls was all fab thanks. Students and staff were buzzing about it throughout the day. Can you send me a brochure of the other Workshops/talks you offer through your company? Hope you have not got a sore throat from talking all day long to.over 1140 students 35 teachers! I am really.pleased that you found us hospitalable and you enjoyed the fish and chips and donut day! Re: #LAUNCH INSET Day Session. “Thanks so much for the training day yesterday for staff on our Professional Day. Everyone was really enthusiastic about your session – not only did it get everyone thinking about how they m,ight motivate students, it also encouraged a really positive attitude amongst staff for the rest of the Professional Day. “The Eco-Fish workshop helped students from Outdoor Education, Sports, Business Studies and Catering courses to work together and tackle a number of issues. Obviously at the heart of the game is Sustainability as countries (teams) have to work together as a type of UN to balance out feeding their country, other countries and leaving enough fish to continue to breed and reproduce for future generations. #LAUNCH Exam Motivation session, January. “The Year 10s never cheer anybody, but they cheered you!” We ran an exam-motivation session for the Year 10 students at Windermere School, an Independent School in the Lake District and the above comment came from the Head of Year, Debbie Dalzell. The students were engaged and enthusiastic, carrying out exercises based on their own attitudes and behaviour towards exams, they are now focused on delivering the best possible grades for themselves and their future opportunities. Faisal Ahmed, Stretford High, Manchester. Bernie was superb, creative and engaging. Many students felt he would make an excellent teacher. I can’t wait to invite such a dynamic, organized and life-changing person back into school! Feedback Sheet, Kirkbie Kendal Sixth Form, #LAUNCH exam preparation workshop, January 2015: Q: What aspects of the presenter’s style of facilitation and engagement did you like/dislike? Sixth form Student feedback: ” ‘best speaker we have had all year’ ‘he was funny and entertaining’ ‘he made me think about making plans for the future’ ‘the hour went so quickly’ ‘could listen to him again’ ‘ thanks for arranging for him to come in – I found it very interesting’ “. Andrew Bernard excelled with our pupils, approachable and on their level. A great opportunity for students and staff, I would recommend Bernie and his workshop to other schools. It has been a real pleasure working with you over all the various projects (Soapbox, Ready to Impress, DELL Powering Transformation… etc!). Innovative Enterprise does fantastic work that I know is hugely valued by schools and has a hugely positive impact on young people. I am so pleased that you are very involved in the Trust – we are lucky to have you! Barclays LifeSkills / Transformation Trust. Teacher, Gillian H, Gtr Manchester Secondary, December 2014. Dear Bernie, Thank you so much for Tuesday – your session was by far the favourite for our year 11 students on their careers carousel. Hopefully we will be able to arrange further sessions! Hi, I wanted to come back to you and let you know what a great day I had at the Academy in Manchester: I thought you were excellent, full of energy and enthusiasm, and fantastic at finding the right balance between controlling the groups, while fostering a lively debate amongst the pupils. Obviously you’re a professional and clearly very, very good at your job, but I had a great time and wanted to let you know. It’s certainly encouraged me to do more LifeSkills in future and hopefully I’ll get to work with you again. Facilitated LifeSkills workshops are a new initiative for schools. Would you like to share any other feedback? I feel this workshop has really helped students to see what it is like from the perspective of ‘real life’ people, who are not their teachers. As sometime they turn off to what their teachers say – but when it is someone else, telling them how it really is it can ‘settle in’ for them. Bernie was fantastic and an excellent facilitator and speaker. The students responded really well to him and got a lot from the workshops, Thank you! Thank you so much for the wonderful Soap Day yesterday. I know that everybody really enjoyed it. You were able to inspire the girls to do their best work, so that they really cared about their products and the outcomes. This is a great gift of yours: you inspired all of us. Liz Davison is the Assistant Headteacher at James Rennie Special School in Carlisle and they were the winners of an Enterprise Soapbox competition in Spring term. 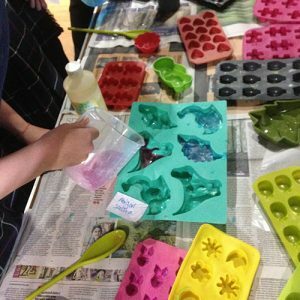 In June 2014 they ran a full day workshop with their students and quickly sold out of the soaps that they made in their school fundraiser! 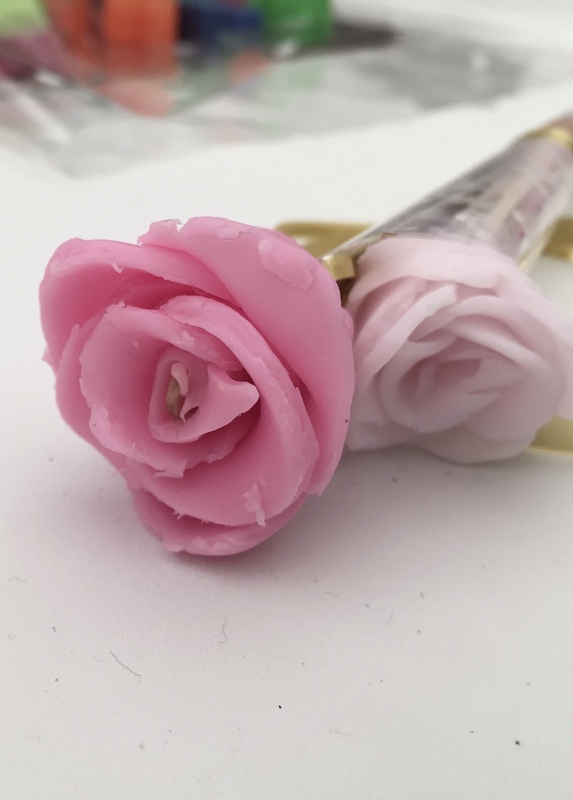 “The soapmaking kit provided a wonderful opportunity for our students to try something new, it was an inclusive project which they could all be part of, and was simple enough to enable them to produce professional looking soaps which they were proud of. 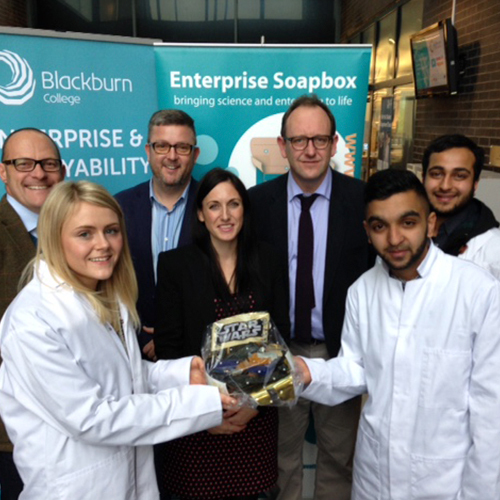 Attached is a PDF review of the Soapbox Enterprise Day and the Enterprise Soapbox kit which they used to raise funds. Toby Mildon, BBC Staff CPD Session. On 9th September we were delighted to be asked to speak to staff at the BBC in New Broadcasting House. in London. Toby Mildon at the BBC arranges a monthly Staff CPD session after work and his database of 400+ staff is growing month by month. He enlists members of the Professional Speaking Association (PSA) to ensure the quality of the events and creates an Eventbrite page for each session. 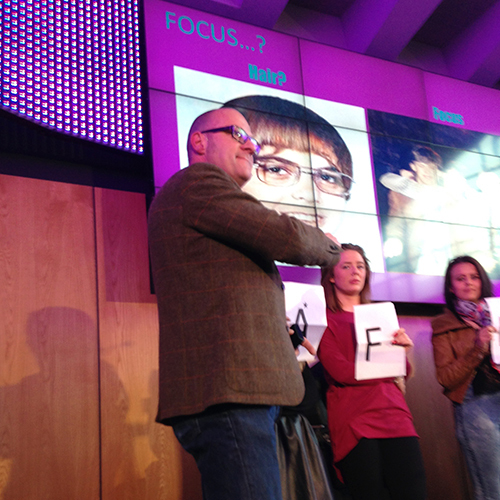 As a Fellow of the PSA I delivered my new FAVE keynote to the audience of excited BBC staff on a sunlit Tuesday evening in Central London and the audience seemed to really enjoy the session which challenged them to assess their Focus; Attitude, Value and Effort and consider their level of happiness using the Wheel of Life! “Bernie is a phenomenal speaker with his humour and outlook on life shining through. He has such great ‘stage presence’ and flawless story telling. As a young lad, Bernie was a bit of a misfit and as he grew up taking on life’s challenges, he grew into an inspiring role model. Bernie is one of few men who I believe authentically inspires young people to harness their entrepreneurial spirit (as he does through his business, Innovative Enterprise). Bernie delivered his talk to my BBC colleagues and everyone thoroughly enjoyed his FAVE keynote speech. He had us hooked from his first words and lit up the audience (at the end of a tiring day)”. Thank you Toby. Here is Toby’s Soundcloud recording of the FAVE workshop for you to enjoy. 4th June – evening Celebration event, Barrow in Cumbria. We delivered LifeSkills with 226 students in Manchester in mid May. Here are some statistics: Students: 226 / Year 7 and 8 / Girls 98: Boys 128 / 8 teachers / 6 volunteers from Barclays. “[The volunteers] were very supportive – working with groups, guiding discussions and activities. Very helpful to have other professionals working with students who have different poits of view. Images linked to dialogue in presentations were very useful for lower ability readers”. Sandra Smith-Brown: “Thank you for delivering Barclays Life Skills at Stretford High School today. Both staff and sudents were really impressed with the high standard of content and the level of student engagement. Steve Leach, Manchester Creative & Media Academy. Once again thanks for all your efforts on Monday and Tuesday, the pupils really benefitted. Please see our Academy blog here for my write-up of the sessions you delivered. Craig Fegan- Stretford High School on 24th April “I thought the structure of the lessons was really good and effective for the children, the host ‘Bernie’ was very good! 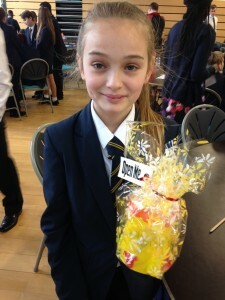 “We had a really fun and interesting day doing the Soapbox challenge with the year seven’s last week. The feedback we have received from them was all very positive. Thanks for coming in and making another ordinary day at school a fun and enjoyable way to learn. ” A. Janganant, Learning Mentor. “We didn’t dislike anything! Great style, engaging and humorous. All the curriculum links and messages we needed were already there in the workshop. We had a great day, the students loved it and want to do it again!” LJ. We delivered a SoapScience workshop with the Year 10 Students at Hele’s School, Plymouth in March 2014. Andy Smith, Head of B&E and 6th Fom Tutor said: “Just a quick e-mail to say thank you so much for your time and expertise during yesterday’s event. “I discussed the session with the lads on Wednesday. Here is a summary of the points raised. 1. Whilst they thought the session would be equally relevent for girls they appreciated the chance to be in an all male group. They have many female teachers in school and your personal experiences as a young man were things they were able to relate to. They also felt is was good to have an all male space in a classroom for a change. 2. They and I could see the link between taking responsiblity for your own health and taking responsibility for your own actions and decisions. Because of this the workshop was informative/educational and motivational. 3. They enjoyed the humour in the session and your direct approach and frankness about your own issues. Your delivery made it “fun”, “mint” etc and not embarrassing at all. on 4th February we delivered a workshop on Business Creation and Deveopment at Wigan Youth Zone as part of the ‘Get a Job’ project working with young people 18+ who are looking for work. The young people worked together and developed their own products, considered their client groups, brand names, product features and marketing materials then stood up in front of the room to present their work after 3 hours. Many of the young people suffer from lack of confidence so this was a major achievement. “I just wanted to say thank you soooo much. You really made the afternoon an enjoyable experience for the students – we got some cracking feedback from them and the companies. And I really enjoyed watching you work with them, especially the first ice breaking stuff, what a transformation in their engagement in just a few minutes – miraculous! Since 2007 we have designed and deivered all of the Manufacturing Institute’s MAKE IT Campaign workshops with a variety of manufacturers from all around the globe. The following came from the feedback we receive for the workshop we designed and ran for 12 NW Schools at Aintree on 16th October 2013 with the Manufacturing Institute’s Make It Team and Survitec – a maunfacturer of Safety Equipment. For the third time, we returned to Queen Katherine School and delivered Stock Market Challange for their Year 9 students. 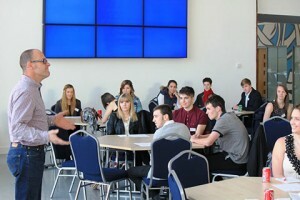 220 students LOVED the full-day session and the profit made was an astonishing £ 162,000 from a starting sum of £15,000! Below is the client feedback we received. It was a fantastic day, students thoroughly enjoyed it. They loved the fast paced excitement of the day and all students were fully engaged and participated well (even the students that would not normally participate in a normal school day!) The only thing I would change next time is maybe have more time at the end for students to add up their profit made (we would discuss this anyway when planning future events)”. For five years, we have delivered SoapScience4YourSchool to a Year 10 group of students at one of the highest achieving Independent Girls’ Schools in the UK. Starting at 8:50am the day ends at 5:00pm after gruelling statistics, business developments, break-even analysis, market research and some AMAZINGLY creative products. “Innovative Enterprise’s presentation style is inspiring and inclusive, and rapidly draws in even those whose approach to regular lessons can be more sceptical. The management of the students is probably the best I’ve seen from anyone who is not a professional full-time teacher- the balance of excitement and containment is often something that outside speakers & others involved in schools liaison find challenging, but this was spot-on”. Norbury Manor Business and Enterprise College has been a specialist school for the past 8 years and in that time we have built a number of successful relationships with local primary schools to support them in the development of the enterprise curriculum in Key Stage 2. Part of this partnership involves staff at NMBEC running Enterprise Days for the students and staff from our 7 partner schools. We have a “menu” of enterprise activities that are drawn from across the whole curriculum and we tailor each day to the needs of the primary school. A typical day will be made up of 3 x 100 minute workshops selected from a range of 50 subject specific enterprise workshops we have written. The introduction of “Enterprise Soapbox” as an enterprise workshop within the Science curriculum area has proven to be hugely popular. The students get to grips with the processes used in to make the soap and can learn to use simple laboratory equipment whilst undertaking a fun activity with a real application and a tangible outcome. There were classes of Year 6 students using the laboratory equipment and Enterprise Soapbox materials to produce bars of soap in time for Father’s Day ! The 2 key members of staff who ran this event at the college, Miss Sule and Mrs Muzenda have been impressed by the quality of the teaching materials and the ease with which they have been able to adapt their use for all Key Stages. The Yr 6 students were divided into 3 groups of approximately 22 students each. We set aside 100 minutes for each workshop and used 2 science teachers and 1 technician to run each session as well as having support from our primary colleagues. While the soap is setting we make use of ICT facilities for making packaging and marketing materials. The students first received some basic health and safety instructions regarding the use of the laboratory and equipment before following a presentation given by one of our own teachers on the soap making process. Once it was time for the practical session, it was all hands to the pump but all students managed to produce the desired outcome i.e. their own bars of soap to take home ! We designed and delivered a fantastic challenge for the Make It Campaign in March 2013 sponsored by Busch Vacuum Pumps. Many people may not know, but these pumps are in many factories that make food, drink, cars, clothes, packaging…the list goes on! Our challenge pitted the 12 teams against one another to design a Food Factory which makes either Ready Meals or a Multi-Pie Plant which makes either sweet or savoury delights! The brilliant teams made some amazing designs in 3D models, factory floor plans and great marketing…including the Pi Pie Factory, geddit!? Pi, maths, STEM and all that! Well, I found it funny. Anyway here’s what the students said:”There’s more to manufacturing than I thought”; “I didn’t realise manufacturing was so creative”; “I’ve enjoyed working in my team and I’ve had a positive exprience”. The votes are in: 97% rated the day as Excellent, Very Good or Good; 66% of students at the end said they would consider manufacturing as a career (up from 44% at the start); all Busch staff said it was Excellent or Very Good; 89% of Busch advocates felt that the day had completely succeeded in improving the image of manufacturing. Finally a teacher said: “Thank you to everyone involved, these events are priceless to students”. The manager of a local Government Pension Office who coordinated the local business people at the local Enterprise Investment Centre was keen to praise the students: “All students were a credit to themselves and to the school: they should all be proud of themselves! All managers came into work today full of enthusiasm and praise for the event. There has obviously been some hard work input by both students and staff as the students were well prepared & well presented. All interviewers thoroughly enjoyed their time with the students and felt that they provided worthwhile and valuable advice to the young people. The students made the interviews run easily and smoothly by knowing what they wanted to say, being concise and focused on the task. So I reckon we helped the school deliver a briliant result for their students! 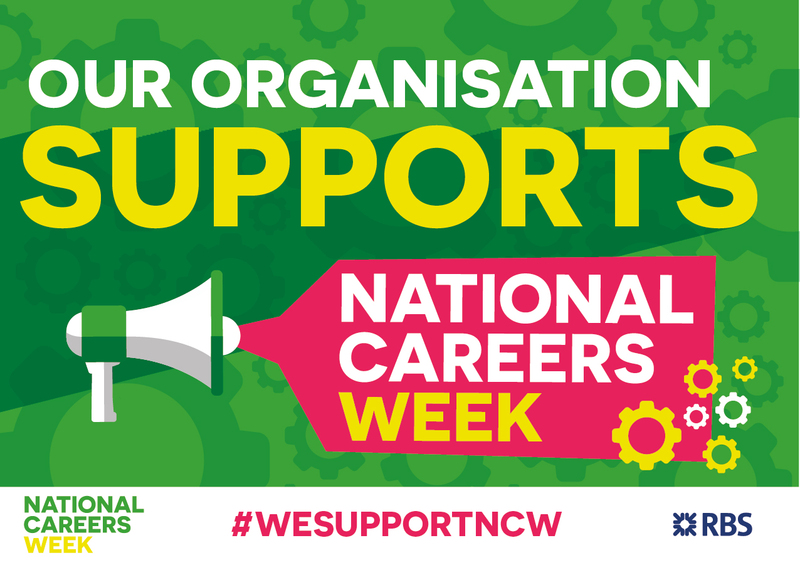 Skills4Work was tailored to the needs of the school and delivered in Careers Week, we worked with Year 10 (180 students) over two days to enhance their skills, confidence and self/employment awareness. What did you like? Active student involvement, the presenters spoke in a student friendly manner and they linked explanations to everyday life and careers. 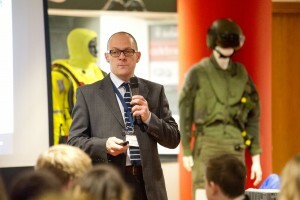 In particular, as soon as Bernie was informed about the school life skills, he immediately changed the focus of his presentation to the students by including the skills. Any further commenst you’d like to add? Both our students and teachers were totally engaged. Planning was done for us, even the room layout and risk assessment. Overall I could not have asked for more. Congleton in Cheshire was the venue for the third annual SIEMENS Make It Enterprising Challenge which saw 12 schools plus two teacher teams challenge it out to see which was the best company on the day! Innovative Enterprise have designed all of the 33 manufacturer-sponsored events in the past 6 years of the Make It campagn and the SIEMENS challenge really stretches the students. Teams compete as manufacturers and instalers of electronic-drive equipment and have to choose a client project to install the equipment solution into – They could choose Rydz Theme Park, Health Haven Hospital, Tastefoods Factory or East Wing Airport – build a 3D model, specify their equipment, cost the solution, visit a customer agent, design some marketing campaigns and present it in front of 150 people! All in 4 hours! Students, teachers and SIEMENS staff were all impressed and the eventual winners, Loreto Grammar School for Girls, were worthy and impressive winners! 96% of students and 100% of teachers on the day rated it as Excellent or Very Good. The change in perception showed that at the start 49% and at the end 68% would consider a career in manufacturing – or 7 students in every 10 present would think about it as a career choice. Student feedback: I would love to have an opportunity like this again; there are a wide variety of manufacturing jobs – all exciting; It’s an exciting, developing industry. “Thank you so much for the workshop last week. The children and staff loved it! I will complete the feedback form soon and send it on but I wanted to thank you for the super job you did – with a bad back! Definitely worth the money and was perfect for our DT and Enterprise Week! 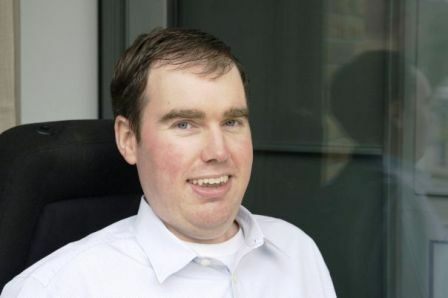 “We have been working with Innovative Enterprise now for several years. Our global entrepreneurship week involves Years 7 – 9 taking part in a bespoke challenge for half a day. The enterprise themes Matt and Bernie deliver are great, and they certainly know their stuff. They are able to customise each day to different age groups and continue to motivate and make every session seem like the first. I liked the way they mixed the groups right from the start – it takes the students out of their comfort zones and then gives them a task where they had to get on with it and work together. The diversity of activities was great. It got the students to take risks and try new things. 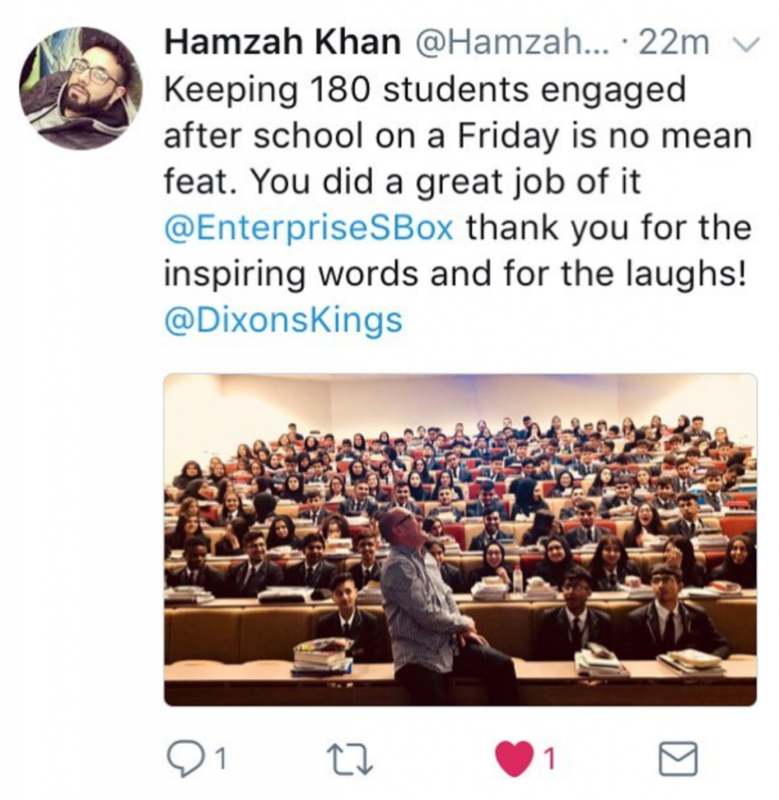 You only had to look at 120 Year 9’s working in teams, staying focused for 2 hours and being able to stand up and present to the audience to appreciate how fantastic, helpful, supportive and professional they are. “A fantastic day. The kids and staff really enjoyed it. It was nice to be able to relax knowing that you were going to take control of everything and we did not even have to be there”. “The girls had an amazing time and said it was the best ‘flexible’ day they had ever had. It was a well organised and executed day so many thanks for putting in so much effort”. “I would just like to formally thank you for getting our Enterprise Week off to such a positive start. You clearly had the toughest job of the week i.e. getting several hundred young people engaged and thinking about a subject which they had no concept of, or desire to pursue, you managed to gain results way beyond my/our expectations! Although you did not see the full impact of your work, learners went to lessons with an open mind and a reflective demeanour. The guest speakers who followed you had a far easier job and they were able to build on the progress made in your initial session. In truth, many of the points made by you were merely supported and reinforced. [Innovative Enterprise staff] were amazing; engaging, organised and extremely hands on throughout the day. They were very quick at getting back to all my emails and answering any questions I had. Staff and students thoroughly enjoyed the day. Brilliant idea, amazing staff, well-resourced and organised. “Thanks for a very imaginative and exciting challenge which made the day a great success. The challenge theme fit perfectly with the GE core values. The transition from the GE presentation to the Olympic challenge was seamless. We have a WORLD FIRST! Our Enterprise Soapbox resource has been used for the first time south of the Equator! St Andrews International High School have been using the kit to teach enterprise as part of the Students’ portfolio for their BTEC Level 2 Business qualification. Read their newsletter here. “100% of the pupils rated the day as between “Excellent” and “Very Good” and the number of participants wanting to work in the sector went from 18% at the beginning of the day to 67% by the end.” – Stephen Melia, TMI. An amazing result and an increased awareness of manufacturing / engineering as an exciting career opportunity. We ran a bespoke full day event for ALL students at Freebrough Academy – Yes, the whole school of 800! – under the banner of Risky Business. “The students had an absolute ball yesterday and loved the event. Many of them rushed to see their heads of college to show them the finished product at the end of the day. We have had some fabulous feedback this morning. West Hill School wanted to run an Enterprise showcase event for some of their local feeder Primary Schools to highlight how they go about promoting Enterprise. 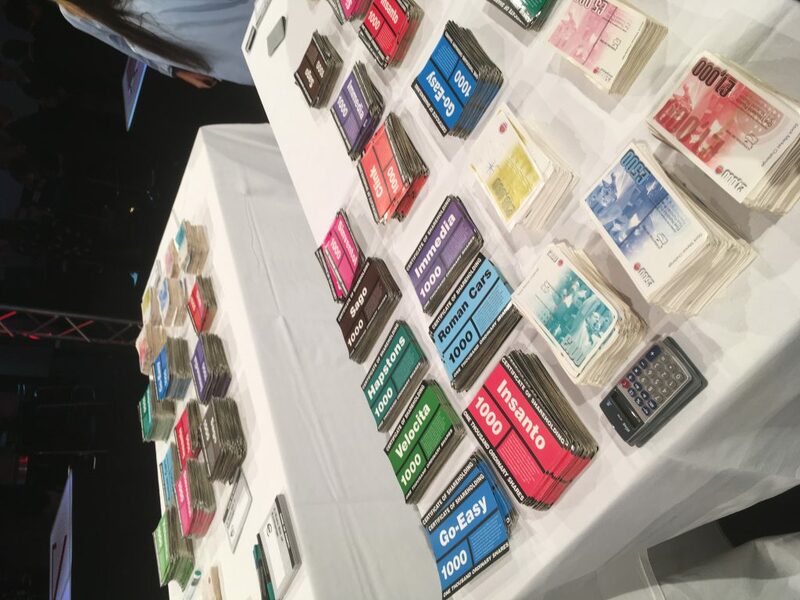 But it wasn’t just about the event – the attending Primary Schools all got a Deep Blue Soapbox resource kit to take away with them, too! Click here to read about what happened. 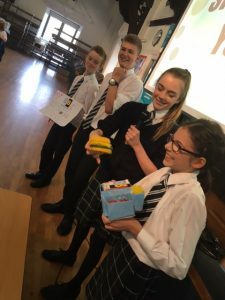 Each July Alder Grange Community & Technology School run an enterprise week for their Year 10 students and since 2009 we have run a SoapScience challenge on the first day of that week, helping to develop the school’s enterprise culture. Click here to read what they thought of this years’ day. 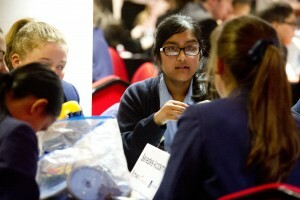 “The students had a great time; I definitely noticed a buzz in the building among the year 9 students after the event. Numerous members of staff mentioned how well they thought the day had been planned and how much the kids enjoyed it. I feel the event has shown our school in a good light as the primary pupils had an exciting, informative and enjoyable day. I was impressed with the way the primary pupils had developed their own definition of enterprise during the day, showed real progression from the morning. Thank you for a brilliant Soapbox workshop. The students loved the day and it ran like clockwork! It was an enjoyable day and well worth ‘buying in’. Feedback from staff supporting, and learners, was excellent. I would have no hesitation in recommending the Stock Market Challenge to other schools. SoapScience was delivered to St Antony’s and was well received. North Chadderton had some positive stuff to say about our work! Mount Grace gave us some very positive feedback! We were mentioned in a local paper, see it here. “Thank you for a brilliant day, facilitated by your great manner with the kids and the way you tailored it to our needs”. Read what they thought, here. You can read their feedback about us, here! I was delighted with the level of pupil motivation…SLT were VERY impressed. “This is the second full-year group event that Innovative Enterprise have delivered and both have been extremely successful – fantastic feedback from students and teachers”. Eltham Green gave us a very positive review. Click here to read the letter. See the newspaper article here! Alsop sent us a lovely letter to recognise the work we have done at their school, you can read the letter here!